GET ON YOUR BIKE FOR CROÍ! This is the biggest charity cycle in the West of Ireland! Join us and experience the stunning route around Lough Corrib. All abilities welcome – cyclists will have a choice of a 45km, 80km or a 120km route. Roadside assistance, support vehicles and plenty of refreshment stops will be provided on the day. Take part in this special 25th anniversary event and help Croí lead the fight against heart disease and stroke. We are so grateful for your support! Reach a fundraising goal of €150+ and you will be rewarded with a limited edition Tour de Lough Corrib cycling jersey and entered into a raffle to be in with a chance of winning a fantastic bike package to the value of €1,000! See pictures of our 2018 event. Enter a team: Join together with friends and colleagues in the fight against heart disease & stroke, while promoting health and well being among your staff! 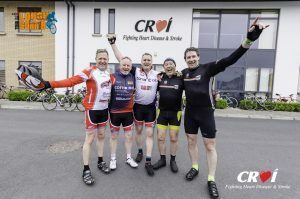 Plus, there will be a team photo opportunity at Croí House after the Cycle! €50+ We ask that all participants raise or donate a minimum of €50 to ride in the Tour de Lough Corrib Cycle. 100% goes to supporting our lifesaving work. Reach this fundraising milestone and you will also receive an exclusive Tour De Lough Corrib finishers tshirt. 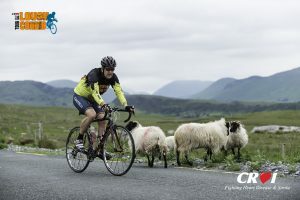 €150+ Reach this fundraising milestone and you will be rewarded with a limited edition 2019 Tour de Lough Corrib cycling jersey and finishers tshirt. You will also be in with a chance of winning fantastic Bike Package to the value of €1,000 in addition to our finishers t shirt. Please remember that we rely on the funds raised at this event and we are truly grateful for your fundraising efforts. Contact lisa@croi.ie to receive sponsorship cards. Starting at the NUIG Regional Sports Pavilion in Dangan, all riders will turn left onto the N59 and ride along Newcastle Road. At the Traffic lights, turn left onto the Quincentennial Bridge and follow the signs to Headford. The Route then follows onto Headford. Riders will turn at Headford and back to finish at Croí Heart and Stroke Centre. 45KM google map. Starting at the NUIG Regional Sports Pavilion in Dangan, all riders will turn left onto the N59 and ride along Newcastle Road. At the Traffic Lights, turn left onto the Quincentennial Bridge and follow the signs to Headford. The Route then follows through Headford, onto Cong. Riders will turn at Cong and back to finish at Croí Heart and Stroke Centre. 80KM google map. Starting at the NUIG Regional Sports Pavilion in Dangan, all riders will turn left onto the N59 and ride along Newcastle Road. At the Traffic Lights, turn left onto the Quincentennial Bridge and follow the signs to Headford. The Route then follows through Headford, onto Cong, Maam, Maam Cross, Oughterard, Moycullen and will finish at the Croí Heart & Stroke. 120KM google map. Each route is fully supported with refreshment stops at Headford, Cong, Maam, Oughterard and once home to Croí House you can rest and enjoy our famous race hospitality – home baked goodies, tea, coffee and sandwiches!